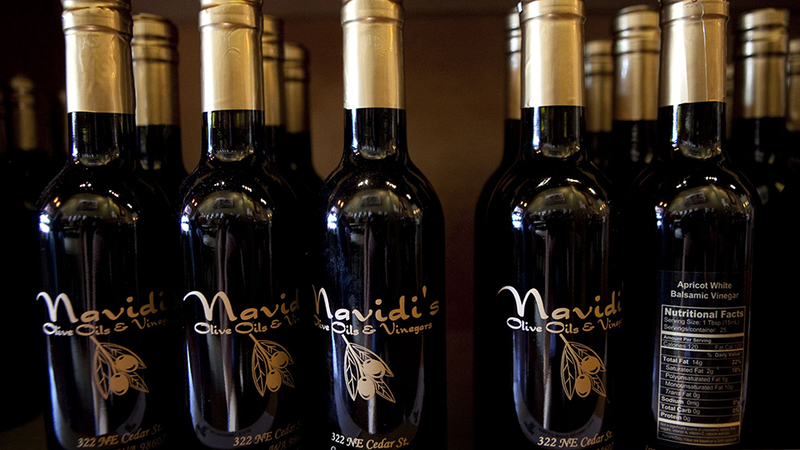 Step inside Navidi’s Olive Oil and Vinegars and take a culinary trip around the world in one small shop. Ken and Gabrielle Navidi opened their store in downtown Bend in 2009 with a passion for educating customers to the subtle but important differences in olive oil and vinegar, how to identify quality, and how to eat healthy. Foodies and newbies alike will appreciate the fine selection of specialty foods, including hand selected olive oils, sweet Italian vinegars, local hand-crafted pastas, blended Asian loose teas, and special flavored sea salts. Patrons are encouraged to touch, smell, and taste the quality of the products before buying, making a trip to Navidi’s a truly delicious shopping experience. Navidi’s maintains a large, unique inventory of hard to find products not normally sold at larger retailers, and introduces the latest and newest products each month. They also proudly carry a large assortment of local culinary products, all to ensure your next culinary endeavor is seasoned with the perfect finishing touch. Navidi’s is open Monday – Friday from 11:00 a.m. – 5:00 p.m., Saturday from 10:00 a.m. – 6:00 p.m. and Sunday from 11:00 a.m. – 5:00 p.m., or visit them online any time you wish.